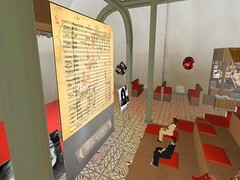 One of my favorite places in Second Life is the Music Academy Online, if you are a music lover and you haven’t visted Benton Wunderlich yet, you need to get there. I met Benton through Joskie, a fellow Educator Coop resident. At my first visit to the music academy Benton was hosting one of his weekly Wednesday night dance parties (9pm) where he was pulling songs from his vast music collection. Great thing with Benton is that he not only plays great songs but he can’t help but tell you about each one as he plays them. Keep in mind, he has taught music appreciation and has a Ph.D. in composition so he “knows” his collection.Monday night night I attended a presentation by Benton called ZAPPA AND IVES. The content of the presentaton was fantastic but the way Benton used Second Life to create a musical experience within SL is what really blew me away. 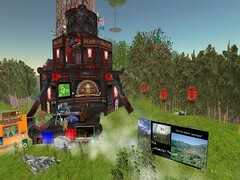 1.Benton streamed music through Second Life and a very high bit rate that enabled each user to control the volume and level of the music they were listening to. Initially I was listening to the music through my speakers but when I wanted to get a “closer look” I plugged in my headset. This individual control of the audio level surpasses a listening session in a face-to-face environment; an audience member cannot simply turn up the volume in a public setting. 2. Benton used text chat to prompt the listeners when important transitions were about to occur. Text chat is the key. In another environment such as face-to-face or radio, Benton would have had to speak above the music to prompt listeners. Doing this would have been a distraction from listening to the music. Text chat on the other hand didn’t get in the way of the music and for me at least, provided a richer experience. 3. 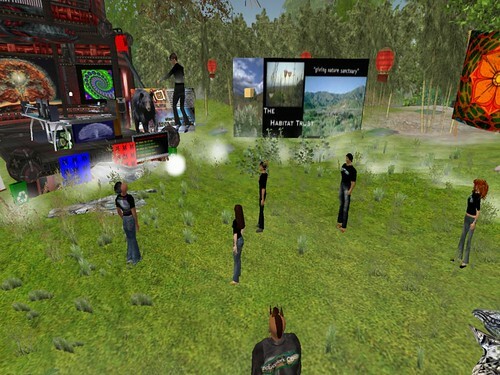 Having the event in Second Life created a shared experience for the audience. I interacted with Benton and other audience members. I knew they were “there”. In fact, the audience requested that Benton replay one of the songs we listened to. SL enabled the shared experience, allowed interaction between the audience, and created feedback loops for the presenter. 4. Visual aids, while Benton was playing a work by Ives he displayed a picture of a conductors score with hand written notes on it. Seeing the Score helped to show the complexity of the music and illustrated the variations that can be taken with a piece. Plus, it was just plain cool to see a musical score to the piece of music you are listening to. In addition to the score, pictures of both Ives and Zappa were displayed. 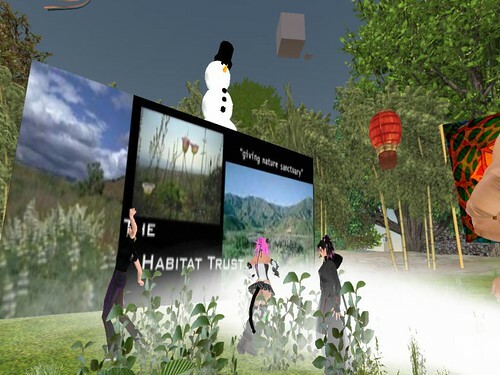 The combination of the music, the narrative, the shared experience, and the visual aids created an authentic learning experience in Second Life that in many ways surpasses an experience in Real Life. 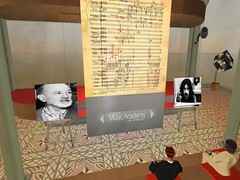 Check out the Music Academy Online in Second Life when you get a chance, a calendar of events is available hereTell Benton El Guappo Sent you…. The students also needed to find a place to host their event and arrange for entertainment. One of the students in the group had already found Happy Clam Island. Happy Clam was a place he had been hanging around outside of class time and he had already become a member of their group. The student arranged to host the fundraising event there and Happy Clam graciously donated their venue and club DJs for the event. A key component of the project is the project mangement plan. Bluewave Ogee (Leslie Jarmon) presented Bluewave’s 7-steps for effective project management to my class in the middle of Ocotber. Based on her 7 steps, each student group wrote a detailed project management plan which included goals, tasks, contacts, calanders, roles etc… They followed this plan as they worked in their team of 4 for several weeks. Alas, the event. At 7SLT last night 11/16/07 the students started Iming their friends, contacts, and groups inviting people to their event. 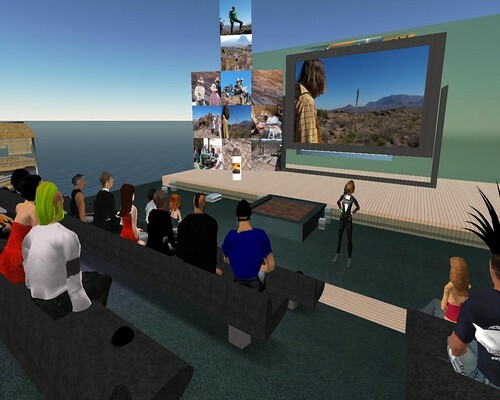 During the semester we had talked about the viral nature of virtual worlds and the importance of tapping into the social networks within Second Life. 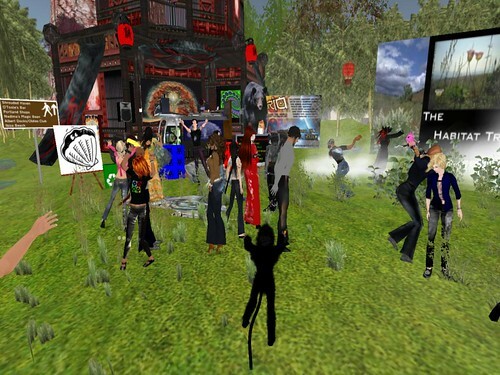 Within a few minutes of sending invites the students had over 30 people dancing at the Happy Clam. They kept a consistent attendance of 30 people throughout their shceduled event. 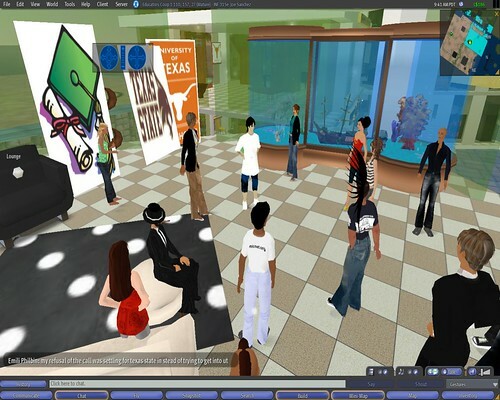 They peaked at 42 avatars which caused the sim to lag and led many people to leave. No doubt they could have had close to 60 people if it weren’t for lag. The first hour the students raised 32K Linden and finally completed the event with 72,000L (around $300 USD). Their invitation is below. I hope to see some of you there, they are tyring to raise $60,000L for the habitat Trust for Wildlife. We are hosting an event on Thursday, November the 15. 9-11 pm central time. 7-9 pm SL time. It will be a benefit concert at the Happy Clam Island. On the Organica Stage. My class island was setup so that each student would have their own space, a condo. The first week of class each student had to claim a condo and by the fourth day of class each student had to use their condo to tell their life story following the “hero’s journey” and give a tour and presentation to their classmates. The condos were fully integrated into my curriculum for the first four weeks of class. For students to claim a condo they needed to put their name on it. I didn’t give the class any directions here; I let them fend for themselves. To put thier name on a condo the students had to learn how to import a texture, create a prim, texture the prim, resize the prim, move the prim, and place the prim on the outside of their condos. Putting your name on a prim is an easy thing to do but remember, these students had only been in SL for a week(including a three day weekend), and most had only been in for a few hours at this point. The students used a variety of tools to create their textures. A few used PowerPoint to make a slide, then they exported the slide as a jpeg, a couple used Illustrator or Photoshop, some used Microsoft paint, but the majority used a variety of Myspace Banner creation tools such as Pimp Text or Glitter Text. I didn’t know about these tools and this is a perfect example of why teachers in SL need to allow room for students to find their own solutions. If I would have set boundaries or given them instructions I would have merely forced them into using my solution (Powerpoint into Jpeg) rather than having them solve a problem and create their own solution (Pimp-text). All of my students were able to accomplish this task on time. I do not teach in a computer lab and the projector installed in my classroom only has a resolution of 800×600 so I can’t really demonstrate SL in my classroom because the screen can’t display the entire interface. My students were able to pick a condo, place their name on the condo, and take a screenshot of their condo with out having a training session, a meeting in SL, a guide book, a list of tutorials or any thing other kind of “training” materials.